Yucca is a hardy, easy-to-grow succulent that thrives in hot, dry climates. They can grow up to 30 feet high and 15 feet across. 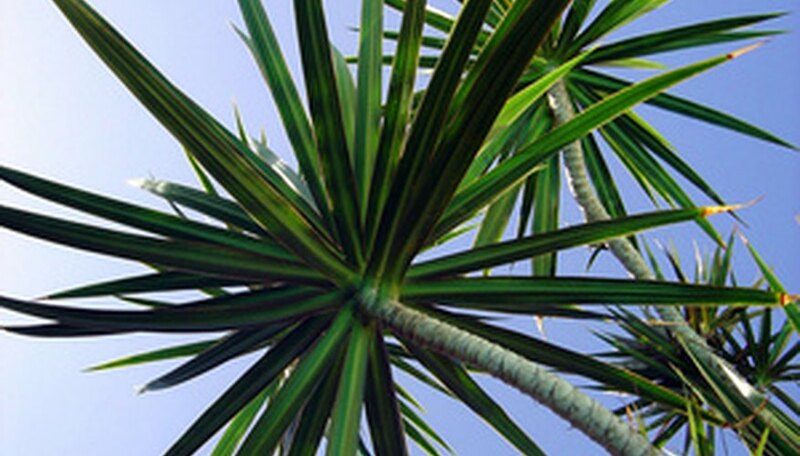 The strong, spiky leaves make the yucca an attractive landscaping plant that requires little maintenance. Yucca are also kept indoors in pots. Transplanting yucca can be done by dividing a plant or by moving an entire plant. Yuccas are not easy to transplant because of their size and shape, sharp leaves and tough roots. For a plant larger than 2 feet in diameter, you will probably need a helper to move the plant around, and you should wear strong gloves and a long-sleeved shirt made of a durable material. Have your helper hold the leaves up out of your way when you're digging up the plant or lifting it from a container. Carrying large yuccas can also be a two-person job. To divide a yucca plant, you will need a shovel, heavy knife, or even a small hatchet. The roots are extremely hard, and you won't hurt the plant by hacking at them. A yucca that's been growing for a long time in one location becomes acclimated to the sun beating down more on one side of the plant. Transplanting a yucca might cause yellowing of some leaves. This happens when the plant faces a different direction than before, and the leaves that were more in the shade get sunburned in the new location. To avoid this, try to orient the yucca in the same direction when you move it, so the tough leaves are towards the sun and the tender leaves remain shaded. Sometimes when you move a yucca in the garden, new plants will return in the old spot. This is because yuccas grow from offsets, which are baby plants that sprout from a shallow root called a rhizome. When you remove the plant, make sure that no offsets or pieces of rhizome remain in the soil. One way to do this is to dig out all the soil from the hole and shake it through a sieve to separate pieces of rhizome. You can throw these away or try to grow them in pots. A transplanted yucca can take up to six months to become established. During this time, the leaves may start to droop or drop off. Leaf drop in a transplanted yucca is normal and probably isn't anything to worry about. You can help the plant become established faster by transplanting it in the spring so the roots have time to grow before the weather gets cold. If you've divided a yucca by cutting a large rhizome, place the cut plant in the shade with a cover over it for up to a week to allow the cut edge to heal before putting it in the soil. If the center stalk of a yucca begins to rot, the cause is usually too much water. This can happen if you've transplanted the yucca to a place that's too wet for it, or somewhere that doesn't have good drainage. It can also happen as a result of over-watering. Make sure you don't transplant a yucca in a sprinkler path. After transplanting, water the plant deeply for a couple of weeks and then stop watering it. Succulents don't need lots of moisture, so only give yuccas water if the soil is completely dried out. Cosmo's Garden: Yucca Yucca Yucca!